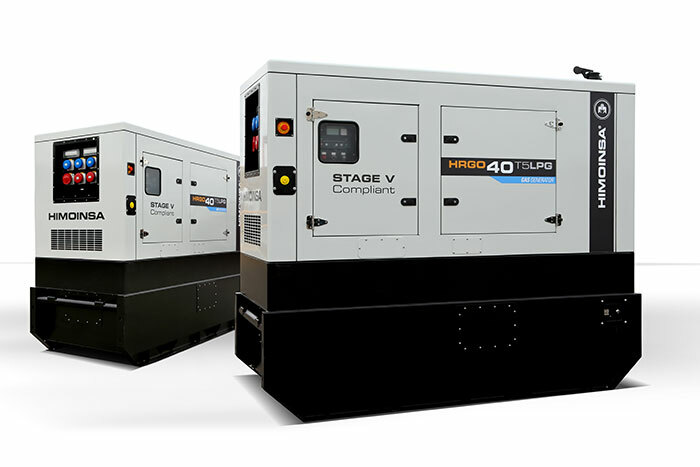 HIMOINSA is introducing gas generator sets into the European market that have Stage V certification and guarantee very similar characteristics to Stage V diesel gensets, and an even greater reduction of emissions thanks to the use of environmentally friendly fuels. These generator sets feature a three-way catalyst that is able to reduce CO, CO2, and NOx emissions among other pollutants, and a residential silencer that allows an attenuation of -35 dB. This therefore makes them an increasingly interesting option for the European rental market. To make it easier to transport them, gas-powered rental generator sets can include an approved trailer as an optional addition. Mobile units that can refuel in any service station that has a propane dispenser. The entire gas installation of the generator sets is approved and certified for road transportation. Gas-powered rental generator sets feature an internal LPG tank with 450 litres of useful capacity which guarantees an autonomy of up to 45 hours without refuelling, depending on the model (70% P.R.P.). There are three different fuel supply options: integrated tanks or external LPG or NG supply. The fuel selector allows the user to choose which fuel source they want to use to operate the unit. In all three cases, safety locks have been installed at the fuel inlet to prevent them from being manipulated by unauthorized personnel. Should greater running time be required, the models in this series feature an external fuel supply socket that can be connected to an external propane tank . For extended periods of use, the HRGO-70 model can be connected to natural gas grid. These built-in tanks are approved for LPG vehicles and have been housed in an independent chassis as a security measure. This ensures that the fuel tank is separate from the engine block which reduces to zero the risk of the tank overheating due to the engine temperature. The fact that it is an entirely independent block makes maintenance work easier. In any case, HIMOINSA generator set tanks only need to be serviced every ten years. How has the safety of the gas gensets been guaranteed? HIMOINSA has added gas sensors at different points of the genset to detect any leakage, and safety relief valves connect to the outside of the genset so that, in the event of overpressure, a gas expulsion circuit can be established. It also features a certified gas train, an extremely resistant double block chassis which acts as a double wall for the tanks and insulates them from the engine group, visual and acoustic signals, gas exhaust valves in the chassis and extra strategically placed ventilation points. It also features a special start-up and stop sequence. The genset only requires maintenance every 500 hours and this can even be extended to 1000 hours by adding an optional kit. As a result, gas-powered rental gensets are a highly competitive option due to the fact that their engines have a longer useful life than their diesel counterparts. The generator sets have wider doors to ensure better access to all the engine and alternator components for correct maintenance and for the replacement of consumables. The HRGO 40 LPG model will allow Bauma attendees to discover all the details of this new range. Visit us on the HIMOINSA stand in Hall A6| stand 308, from the 8th to the 14th of April in Munich, Germany.